Finnbogi Pétursson Franz Pommasl BJNilsen Jacob Kirkegaard Mike Harding Kent Tankred J. G. Thirlwell PerMagnus Lindborg Jana Winderen Hans Sydow Brandon LaBelle Petteri Nisunen/Tommi Grönlund & an ensemble piece arranged by BJNilsen. The first CD from the freq_out collective [curator: Carl Michael von Hausswolff] results from the work done by the team at d!sturbances, Copenhagen, June 2003. Where: Any large self-contained space will work. 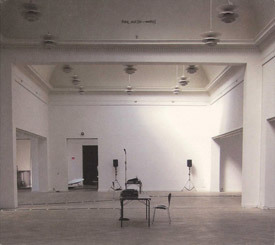 The first event took place at Charlottenborg Exhibition Hall, Copenhagen, Denmark, in June 2003.
Who: Encouraged by d!sturbances, Swedish artist and curator C M von Hausswolff assembled a collection of 13 artists representing the elite of international sound art. The group consist of sound artists, architects, composers, producers, sculptors, mathematicians and visual artists. The installation was part of a larger event taking place at the Royal Danish Theatre and Charlottenborg in Copenhagen. How: Each player is assigned a frequency range to work with. This process is carried out in situ, each player using a workstation consisting of mixing desk and PA system. All the resulting sounds are then mixed together in the space provided to create a sound installation. Why: The project reveals how space-specific certain frequencies can be, but also how other sounds can be separated from their source and ‘thrown’ around the space. It also shows how sound ‘fits’ (or not) into the space provided by exploring the complexities of frequencies and their inter-action. The final mix not only reveals the innate properties of the frequency ranges, but also the possibilities when they are combined.